BLEAU -Comitatus Bellovacum Vernacule Beauvais. BLEAU, J. - Comitatus Bellovacum Vernacule Beauvais. Comitatus Bellovacum Vernacule Beauvais. - BLEAU, J. Title : Comitatus Bellovacum Vernacule Beauvais..
Map maker : BLEAU, J.. Size : 17.0 x 21.5 inches. / 43.2 x 54.6 cm. 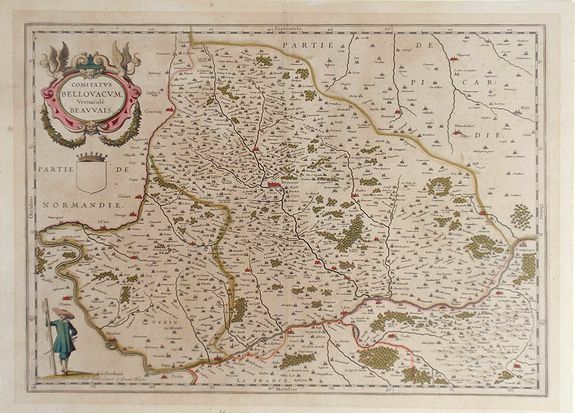 Description :Bleau map of northern central France region, showing area just north of Paris. Condition : Overall light discoloration of paper, pencil notation written in bottom margin, very minor foxing in margins.